Performance improvement is on every CEO’s agenda and most reckon they have a clear idea about how best to pursue it. Details in the playbook may differ from company to company but the broad strokes are familiar to most leaders. Every now and then a CEO will reach a critical point in his or her career where he must decide whether or not to throw out the playbook and start again. But in doing so sometimes a leader must also re-examine the standard playbook in his own head-the assumptions, ideas and received truths that have filled his or her mind over many decades of experience that have served the leader well. After all, it’s probably what brought him to the corner office in the first place. A Duke University-trained mechanical engineer, Lewis Campbell, 60, joined Textron as EVP and COO in 1992 after a 24-year career at GM, where he held a number of key management positions including general manufacturing manager of GM’s Rochester Products Division. A William Holden-type with glasses, the soft-spoken Winchester, VA, born executive sporting his trademark blue shirt looks the part. He became president in 1994 and CEO four years later. From the time he joined the company to a year after he became CEO he saw Textron’s share price rise from 20 to 98. (The company is perhaps best known for its Bell Helicopter, Cessna Aircraft and E-Z Go golf carts as well as its role, along with Boeing, for producing the V-22 Osprey in addition to other specialized military vehicles.) But six quarters into what looked like a promising start as CEO, Campbell faced the perfect storm. In May 1999, Textron shares fell nearly 70 percent from its 98 peak at about 24x current year earnings to around 30 in late 2001. Much of the decline was precipitated by poor capital allocation decisions that led to ill advised acquisitions of unfavorable industrial businesses. The company’s EPS-focused business model that awarded quarterly accretion forced management to invest funds in acquisitions to avoid dilution. This was made worse by a collapse in the business jet market that sent Cessna into a nosedive. To make matters worse, over earning industrial businesses such as E-Z-Go, Jacobsen and Greenlee started to turn south. The operating income lost from these businesses alone represented an earnings drag of $0.60 a share. The downturn following 9/11 only made things worse. Many CEOs facing such a crisis would be content to fall back on their own experience. Campbell chose not to. Subordinates describe him as someone who has a willingness to learn new things and perhaps more importantly, to change himself. As the granddaddy of conglomerates Textron was exhibiting business model fatigue. Each of its businesses was expected to meet its EPS targets and deliver a tribute to corporate.The operating companies were in their own orbits sharing little with one another. As he relates in the interview nearby, Campbell knew he had to change, but even he was unsure just how fundamental the transformation would prove to be. “I saw the ï¿½ï¿½movie’ at GM and I was darned if I was going to sit through this again,” he remembers. The result is a company with a fundamentally different conception of itself. Gathering an inner core as his war cabinet, Campbell did away with the conglomerate and created an enterprise network where each unit had to create value and not be just a caretaker. Ruthless efficiencies were enforced. Eighteen hundred payroll systems were reduced to three; 154 healthcare options from 38 providers were replaced by one plan; and 88 data centers were reduced to two. But the transformation was more than another exercise in re-engineering. Campbell soon discovered that he had to change the way Textron people thought about themselves and to do this he started with himself. In adopting Six Sigma, for example, Campbell took the time to go through the rigorous training himself and in March 2006 earned his green belt. “Lewis is good at switching off from relying on his experience and understanding when that experience might not be valid in specific circumstances,” says Stuart Grief, Textron’s VP of strategy and business development and a member of the transformation’s leadership team. “Imagine what it’s like to be left to your own devices for years and suddenly having an activist center. 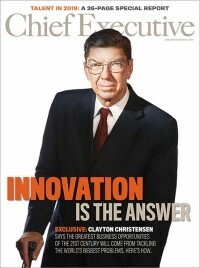 If you don’t do it right, it will be perceived as gross intervention,” adds Cessna CEO Jack Pelton. Although most of the internal heavy lifting is behind them, Campbell cautions that much work needs lies ahead. Among the tasks is a major, well-orchestrated multi-faceted brand improvement process that integrates all aspects of the brand name with Textron’s disparate markets. “Some people still expect me to flinch,” he says with an amused grin. For an organization once afraid of change, one that according to one executive would “freeze in the headlights at the prospect,” today it has almost a “bring it on” attitude. What it’s like working every day in a “Harvard Business School” case study. Before he could transform the company, Lewis Campbell had to transform himself. The 60-year-old native of Winchester, VA, who became Textron’s CEO in 1998, talks about why it became necessary and what he had to do to make it happen. In the 1990s, we acquired a lot of companies. At one point we had sold off $5 billion and had acquired $5 billion worth in revenues, and we were only a $10 billion company. Think about the turn! We were acquiring primarily private companies and bought them at pretty good prices because we were known as the “friendly acquirer.” Over time this meant that we inherited many redundant functions such as payroll systems, benefit programs, data centers and research facilities. Our ability to create sustainable value was being eroded. When I became CEO in July 1998 we enjoyed six successful quarters, but afterwards it was pretty darn obvious that our business model was no longer working. We didn’t know why, because the earnings were still coming. Quarterly EPS year-to-year improvement when I came here was 8 or 9 percent, and at the peak it was 15 or 16 percent with no restructuring either. But too much of our EPS depended on acquisitions, and not enough on return on invested capital. We woke up. Our return on invested capital was not quite as good as it should have been. After a strategic offsite meeting with the board in September 2002 directors were asking the question, “Lewis, what is your vision of the company?” I said, “Well, I want to do this and this and this.” They said that’s not compelling and they were right. As the board kept hammering me to deliver a vision for the company, I began writing one, but found it wasn’t easy. Ultimately we want to be a premier multi-industry company recognized for its strong local brands, powerful enterprise processes and talented people. We decided that our strategy was to develop a core competency-actually two core competencies: portfolio management and enterprise management-and to be recognized for it. Enterprise management was all about using the network enterprise and shared services. For example, at one time we had 88 data centers, we need 2; had 154 healthcare plans, we need one; we had 1,800 payroll systems, probably didn’t need too many of those either. What was the epiphany that gave you the solution to change the company from a disparate collection of businesses to an operationally integrated enterprise? At the outset I had not a clue in the world what to do. Yes, I had some ideas, but I hadn’t gone to the beach, like some guys do, to sit for 37 days until the inner light bulb turns on. We spent the next year and a half with our executive leadership team working through a foundation of transformation. We decided that we were going to have a network enterprise, one that would leverage the size of the company and become ruthlessly consistent without exception. But the most surprising insight- something I should have figured out earlier-was that the secret weapon of transformation, the big lesson we had to learn, is that people really need to believe it’s good for them, otherwise it will not be successful. As a CEO, I also came to understand that transformation has nothing to do with how “stupid” the organization is or about how “bad” the prior CEO was or about a particular planning process. It’s really about me. I realized that I had some bad theories in my head that prevented me from being what I needed to be in the situation I found myself in. If I didn’t change, I had no chance to win. The real battle any CEO has is not only how well one does while in the job, but how well the company performs five years after one leaves. Look at companies who were on a great trajectory. The CEO retires, great guy follows him, boom, nothing happens in shareholder value for five years. So if you ask what motivates me the most, it is creating a sustainable product development and reinvention process. Now it’s five years later from the day of my epiphany. Take our proxy statement, which tracks $100 invested in Textron on the last trading day of 2000 and compares it to the S&P 500 and our industry peers. This year we’re up something like 180 percent. Our proxy peers are up maybe 20 percent, and the S&P is up five. It’s a fabulous preliminary scorecard for the first five years. So now we think we’ve really got this figured out. But I’m scared to death because in transformation, success is not your friend. In what way do you work with the board differently today than you had previously? The challenge facing a new CEO dealing with the board is very interesting. You don’t instantly appreciate how strong you have to be on the things you believe in, because you’re talking with the group that’s going to decide whether you stay or go and how much you get paid. The other thing that changed is how we involved the board after a few members reached mandatory retirement allowing new members to join. Together we decided on a cross section of talented people to join because I needed help on certain issues. If there’s an expert on the board, I dispatch him to a unit either in trouble or in need of a different opinion. The director is my internal consultant. They report to the board on whatever they learn, which may prove unflattering to me. If you’re going to transform a company and you have somebody who has the brains to help, yeah, you have to be. The old me wouldn’t have been. In essence, your fear sets you free because if the board knows you’re doing that, what are they going to do? Strangle me because I sent a board member out and he comes back with a bad story? No. Now that we know the bad story, they pay me to fix it. So is the transformation really making a difference? Here’s a great set of numbers for you. Cessna hit a peak delivery volume of 313 in 2001 with a margin of 13 percent, with a return on invested capital in the 20s. Pretty good business. At about 300 planes delivered, they’ll have between 35 and 40 percent return on invested capital today. Think about it. That’s a money machine. It’ll generate as much cash this year as we paid for them in ’92. Now that you’ve integrated the businesses and achieved operational efficiencies what new things can we expect? Now that we have accurately defined all the value streams-they number in the hundreds-we have prioritized them and have created a scoring system to measure how well the organization is migrating toward them. It’s never perfect, but, if one thinks in terms of attaining bronze, silver or gold, we strive to be at the gold level with the majority of our value streams by the end of 2008. Does this mean you’re going to introduce Textron as a brand? We are debating that heavily. The problem with that is, we’re more a house of brands. So it’s Cessna, a Textron company. How the Textron piece figures in this is unfolding, but if Textron had the right reputation, it would also carry some brand aura into Cessna. Right now, for many customers, it doesn’t. How sustainable is your transformation? That’s the big question. To be a premier multi-industry company you have to double in value every five years, probably for a 20-year period. For the first five years we’re within an eyelash of being on target. But we have got to do it again and again and again. That’s one measure. We also have to figure out how and when we begin acquiring because eventually, we’re going to have to add to our mix, and there don’t appear to be many bargain opportunities presently. There are some multi-industry companies that have done well over a long period of time. Although it’s been having a pretty rough patch recently, GE is a good example. Size matters. But size in and of itself can also be a hindrance. You have to grow carefully. How do you cultivate leadership three to five levels below the CEO? We do a twice-a-year review. A mid-year “how you are doing, what do you need to do better” review is followed by an end-of-year “here’s how you did” and “what are your objectives for next year” assessment. Every September, I take to the board a clear system-produced summary that allows the board to view at least 200 executives. They’re scored on two things: their performance in their current job and their capability to perform in the future needs of transformation. We understand that a company is only as good as its leadership teams. We engage the Center for Creative Leadership and use some of its processes to improve the way teams work together. In addition, we’re thinking of launching Textron University over the next year or so, which will be a virtual university that will, among things, deliver Six Sigma. It will be run by an internal board of leaders within the company who will decide what courses ought to be taught. It will help address certain weaknesses in our skills by helping to bring people up to speed. How often do board members actually get to see some of these people in situ-not just when they make presentations at board meetings when everyone’s on his best behavior? At least one of our six board meetings is devoted to a business unit where we showcase executives. It’s not going to a conference room and listening to the CFO or whatever. We’re interacting with men and women that are doing all sorts of things. We tell the board to watch a Mary Jones or a Peter Smith because they are the future in their respective organization. We have a second venue, which we affectionately call our pit, where we pick 10 to 14 high potential people from various levels and invite them to attend a board dinner. These folks are spread out amongst the tables. From the board’s perspective they could be anybody. For middle to higher-level folks, we organize social events, usually a sporting event; for example, a three day bird shoot in South Carolina. We invite board members; some go, some don’t. Have you been to a bird hunt? Where we go, two people go off on a jeep hunting for half a day. If I’m out in the woods, I don’t know what’s getting talked about by others who are elsewhere in the woods. You fly fish with somebody for five to seven hours; you get to know a person. You just can’t keep your guard up that long. You lose your temper or something happens and the board director gets to see the real you. Do you take measures to filter what board members might learn from executives several levels below you? For example, when a board ember learns something unusual is he or she expected to report the fact back to you? If you want to be transparent, you might as well just be transparent. If I were a board member and thought that the CEO was prescreening what people should say, I wouldn’t like that very much. People who work for me have no obligation to tell me what they have said to a board member, unless the director tells them, “Hey, would you make sure Lewis knows we’ve talked about this?” or if they think that they might have gotten themselves in a place where they didn’t want to be, or they’re afraid the board member didn’t understand something. Otherwise they have no obligation, none, zero. That’s another thing about our talent zone that’s so great. This is like working every day at the Harvard Business School. Because you have these different case studies that are ongoing with no proctor to tell you how the real story turned out.